Back in 2009, the further education institution for which I then worked asked me to head up a project in Second Life. In essence, I was asked to buy, build and teach on a virtual island in a virtual world. For two very happy but (admittedly) not entirely successful years, this is exactly what I did. Not on my own, I hasten to add: I was aided and abetted by a work colleague who, through our love of all things techy, shared sense of (inane) humour and willingness to work around the clock to design, build, tinker with and think of ways to use the virtual space, went on to become one of my closest (real world) friends. Neither of us works for the institution any more: I’ve moved to Cardiff University and she does incredible work with the Society for Companion Animal Studies. But, as is typical of me, I digress. The project wasn’t entirely successful for a couple of reasons: we were fired up with enthusiasm, had a blast building the island…then didn’t really know what to do with it. Remember my advice in a previous post: if you build it they will not come? This is something I learned the hard way. That isn’t to say that things weren’t beginning, ever so slowly, to pick up: a lecturer delivering a degree in animation used the island with his students to create 3D art and learn the basics of building in Second Life. I held a couple of tutorials with real life PGCE students which worked especially well (and could become the basis of a future dissertation), but I also delivered a wholly unsuccessful introductory teaching course for people looking to teach in the real world, but willing to complete their training in a virtual world. The failure of this course knocked my confidence to the core, and I started to lose faith in my abilities as a teacher trainer and as someone considered to be proficient in learning technology. At exactly the same time the credit crunch started to take hold. Funding was slashed from the budgets of further education institutions, and Linden Labs, founders of Second Life, decided to stop offering educators’ discounts for land rental, meaning that the price of renting virtual land doubled overnight. Had we made any real progress in using a virtual world as an alternative platform for teaching, the college may have found the cash to continue with the project. However, the project’s overall lack of success meant that we had to abandon the island. I took this very personally, felt like Second Life was a shining beacon highlighting my complete failure, and vowed never to log into Second Life again. That is, until a couple of weeks ago. The team responsible for the PhD in…… asked to meet with me and discuss some of their plans for learning technology within their programme. We discussed iTunes U, eBooks, vodcasts and podcasts, then I mentioned in passing Second Life. Not only were they familiar with the virtual world, they already had avatars that they had set up several years previously, but they lay dormant, waiting for something to come along that would allow them to come out of hibernation and use SL as a place for teaching and learning. Enthusiasm re-ignited with our talk of using SL as a space for tutorials and group discussions, as well as the possibility of using the space as somewhere to carry out medical simulations, I went home feeling hopeful that maybe enough virtual water had gone under the bridge to allow me to go back into Second Life. As much as anything, I was curious to see what the old place looked like a couple of years after logging out for what I had assumed would be the final time. I hadn’t followed any news about Linden Labs or Second Life, so to all intents and purposes was a newbie, albeit a newbie with some prior but out of date knowledge. On logging in, the first thing I noticed was how ropey everything looked. What, 4 years ago, had looked pretty slick now looked cheap and tacky. Graphics cards and processors have advanced…but for some reason, Second Life had not and appeared to be stuck in a time warp. I had heard through the grapevine that there were many advances in scripting and building within the virtual world, and had initially been concerned that my avatar would not have aged well – on logging back in, the first thing I’d assumed I’d have to do was buy a new body, skin and clothing in order to look more ‘up to date’, but there were no other avatars around to compare my prehistoric looks to, so I decided to put plastic surgery on hold and look for those old educational haunts (and virtual bars) I used to frequent. Typing ‘university’ into the onboard search engine prompted surprise number two – there were not as many educational sims in Second Life as there had been. To be fair, I had been expecting this: the effect of Linden’s price hike at a time of global economic uncertainty was bound to result in many establishments jumping ship and moving to cheaper or free virtual worlds such as OpenSim. The real surprise then, when I visited the few familiar places that had survived was that they hadn’t changed. And that they were all empty. Had these universities been in different time zones, I’d understand the silence: while I was wandering around, everyone in the real world would be in bed. So I tried a few places closer to home. I teleported to a few ‘local’ universities that I had once had links to. Like a 2 dimensional Cillian Murphy in 28 Days Later, I wandered around empty sims looking at posters advertising workshops that had happened 4 or even 5 years ago. This confused me. Why pay huge land rental prices for sims that clearly weren’t being used? A couple of places were clearly still in use as they had changed appearance and were offering workshops and courses that were current. Yet even these packets of virtual land were still devoid of any other avatar. I tried some of the more generic, popular sims. An Irish bar. Empty. A role playing sim for fans of gothic horror. Empty. In the past week I have logged into Second Life at least half a dozen times…and so far have seen 5 other avatars, and spoken to absolutely nobody. The best I can say is Second Life is coasting along. Use probably is slowing. There is no doubt that it is down from the earlier 80k peaks. And there is no doubt that we have fewer regions than we once did. Whether those that are left are better quality or not is hard to say. My guess is that Linden Lab calculated that even if they solved all current issues by investing a million or two on reengineering legacy systems, revenue would still decline over time. OpenSim and other emerging platforms are offering land at a tenth the price of Second Life. As the competition’s communities, economies and capabilities mature, Linden Lab’s customer base will continue to erode. A dramatic cut in land pricing isn’t an answer because that would create a corresponding cut in revenue. There is no sign that the market for sandbox worlds like Second Life will significantly increase in the foreseeable future. So there’s really not a lot of upside for them. It’s no wonder that they made the decision to take advantage of their current cash-rich situation to invest in new products that offer, at least potentially, a much higher return on investment. It seems then that Second Life is falling out of favour. As of last year it stopped publishing statistics and its net land size has decreased sizeably. Linden has recently contacted a selection of educators inviting them to return with the old Educators’ discount. Responses, perhaps understandably, have been negative. “You let us down before” they say. “What’s to stop you from doing it again?” Have Linden done this out of desperation, or because they are starting to see that there are uses above and beyond Gorean role-play and virtual nightclubs? I guess I’ve always believed that where there’s life, there’s hope. I’m fortunate enough to have some free office space in Second Life (care of the University of Leeds), and my renewed sense of ‘virtual world vigour’ means that I still think there’s a use for virtual worlds in education. So I, along with my colleagues who want to look into using SL as a space for reflection, discussion and simulation will prepare to take this virtual bull by the horns and see if we can make a difference this time. Meantime, anyone reading this post who has used or is using Second Life from an educational standpoint, please contact me and let me know your thoughts. Am I on a hiding to nothing (again)? 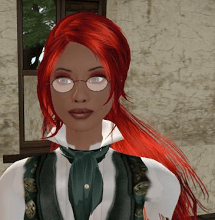 Is there still some life in Second Life? Is this a temporary lull or a sign that the virtual world’s days are coming to an end? And what lessons have you learned in your time in a virtual world? This entry was posted in Technology Enhanced Learning and tagged avatar, Second Life, Virtual Worlds. Bookmark the permalink. There is quite a bit going on in virtual worlds (VW). Cloud Party and Oculus Rift may be things that revive VW. Concurrent use in SL peaks at about 60+k between 1 and 3 PM. With changes to SL users are spending less time logged in but there are more users. Without the Lab’s stats that is hard to verify. But, empirical evidence points to that claim by the Lab being accurate. If you want to find people use the Destination Guide. Busy regions drop out of the What’s Hot list when more than 25 people are there. So, mostly regions with 15 to 20 people show up in What’s Hot. The interest in mobile devices and the corresponding loss of home/office PC sales is going to have an impact too. Mobile devices are not up to 3D real time rendering of VW’s. Europe’s drop into a triple dip recession from colder weather and higher energy costs is likely to have an impact too. With the Russian scientists predicting 200+ years of cooling ahead… rising energy costs… budgets are likely to become even more constrained. While this may sound dismal, for educational institutions it may make for opportunities. As wealth decreases institutions that can provide education at lower cost will have an advantage.